Removable Dual Interfaces Design - USB and 3.5mm audio interfaces are used. Two removable deigns, while compatible with PC devices, also support multiple mobile deviecs. Plug and play, providing more choices and making the scenes of sound more diversified. Note: 7.1 surround sound is only available on PC with USB cable. Immersive 7.1 Virtual Surround Sound - Create an immersive gaming experience with stereo surround sound in the game. Accurate sound positioning, easy identification of enemy positions, to avoid surprise attack, defear the enemy to win. Perfect for shooting games like Call of Duty, PFS, Destiny 2, Tom Clancy’s Ghost Recon or Fortnite etc. 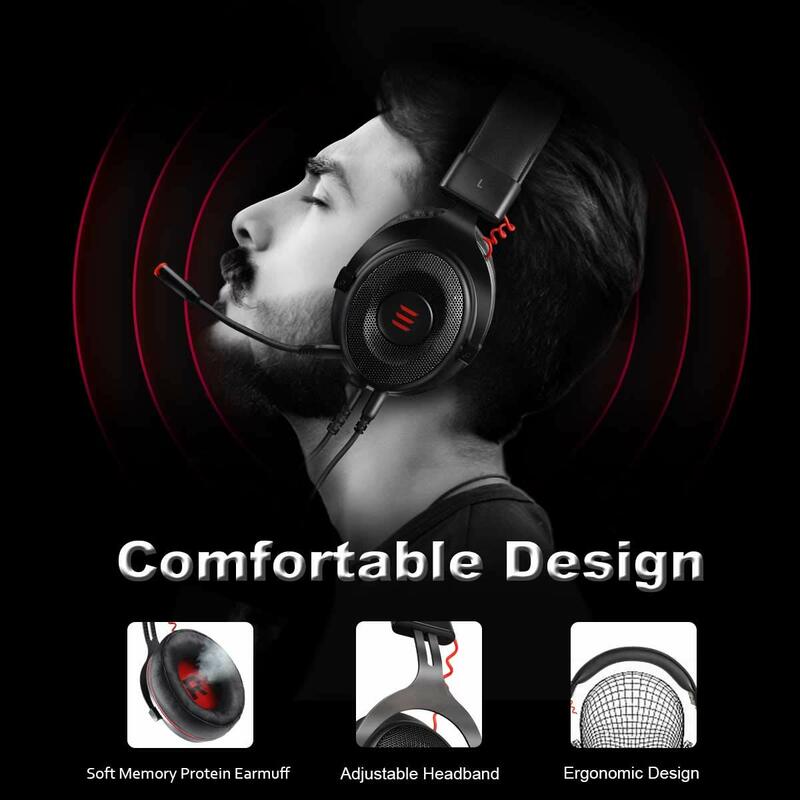 Multi-platform Compitable - EKSA 7.1 surround sound gaming headsets works on PS4/ PS4 Pro/ Xbox One S/ Xboe One/ PC/ Mac/ Nintendo Switch/ PSP/ Laptop/ Smartphones and other devices with standard 3.5mm audio jack and USB interfaces. An extra adapter is required for old-version Xbox controller; Nintendo Switch doesn’t support microphone feature on gaming headset. Great Humanized Design - Designed for all-day comfort. With soft memory protein earmuffs on both side, you won't feel any discomfort while wearing this 7.1 gaming headphones even for long time gaming. The headband was designed for balanced weight distribution and reduced clamping force to maximize comfort during lengthy gaming sessions. 2 Years Warranty 2-Years Manufacturer's Warranty and Unconditional 30 days Money-back Guarantee. Any request or suggestion of our products, please feel free to advise us. EKSA always focus on designing and making the best products and providing the best customer service.